"It seems to be a trait of humanity to assume that we are right even when we are wrong. And if that is the case, what hope is there for any of us? Are we destined to drift aimlessly on an ocean of conflicting information, stranded on a raft we have poorly pieced together from our own biases? "Is it possible to find truth? "The purpose of my remarks is to proclaim the joyful message that God Himself—the Lord of Hosts who knows all truth—has given His children the promise that they can know truth for themselves. "The Everlasting and Almighty God, the Creator of this vast universe, will speak to those who approach Him with a sincere heart and real intent. "He will speak to them in dreams, visions, thoughts, and feelings. "He will speak in a way that is unmistakable and that transcends human experience. He will give them divine direction and answers for their personal lives. "Of course, there will be those who scoff and say such a thing is impossible, that if there were a God, He would have better things to do than hear and answer a single person's prayer. "But I tell you this: God cares about you. 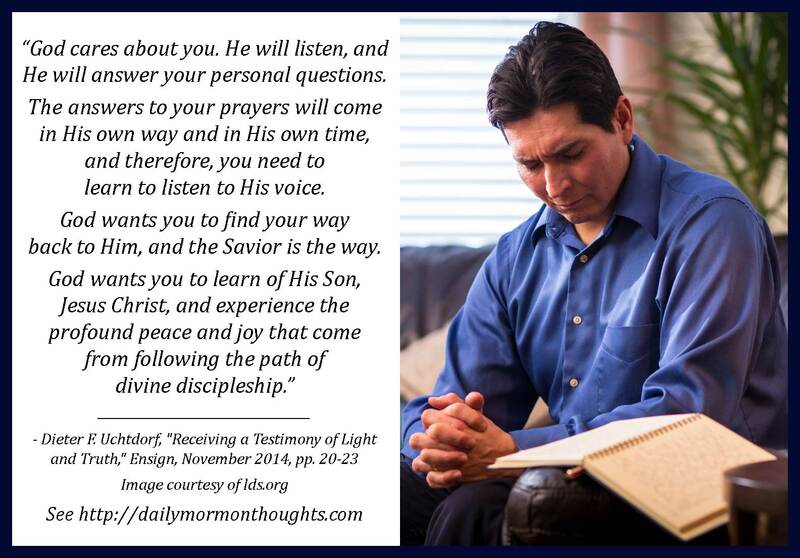 He will listen, and He will answer your personal questions. The answers to your prayers will come in His own way and in His own time, and therefore, you need to learn to listen to His voice. God wants you to find your way back to Him, and the Savior is the way (see John 14:6). God wants you to learn of His Son, Jesus Christ, and experience the profound peace and joy that come from following the path of divine discipleship." The first paragraph offers an implied challenge. It seems to be our nature to always assume we are right, but this is probably not the case. So we should more often question the certainty of our path or belief, to make sure it is the best one, the true one, the appropriate one. 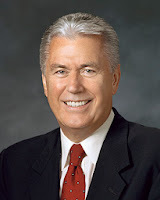 And the explicit promise President Uchtdorf offers is that God is ready and willing to help us in the quest for truth. He will speak to as directly and personally as we ask in righteousness! And in that communication with God lies not just comforting answers or reassuring confirmations, but "the profound peace and joy that come from following the path of divine discipleship." Labels: communication, joy, peace, prayer, Uchtdorf Dieter F.